This last weekend I've had my 3rd race of the season with the DC region SCCA. Here's round one and two if you missed them. It was a beautiful day in Frostburg, MD with temperatures in the mid-60s instead of the 80s like last month. Before the race, I did some random maintenance on the car. I found that the poly insert on my dogbone motor mount had cracked most of the way through. I can't complain much though, I bought it used for $30 so I bought new energy suspension bushings and pressed those in. Also after doing the 67mm throttle body and HFC last month I've been running too lean and burned up my plugs a bit. Replaced those and I finally got a tune from Focus Power (Tom's Tune for those Focus people). The car drives completely differently now in a great way. It feels like the power is available a lot sooner than before and some of the random surging and hesitation common to the SVT is gone. 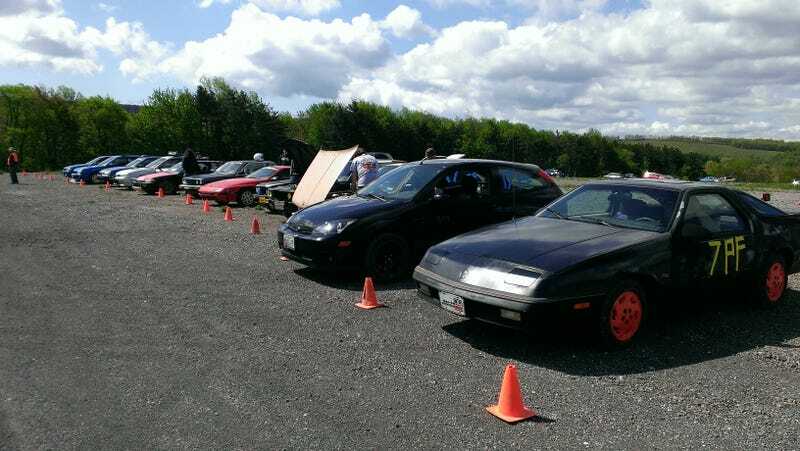 There was even less competition for FWD this time but I did have a new car in my class, an 87 Dodge Daytona. It had the 2.2 turbocharged engine... but it's also 25 years old and it's lost some of that power over the years. There were also a couple civics as usual but in the Modified class above me. There were around 40 entries total but again, 80% were Subarus and maybe 5 or so old BMWs. Morning runs went pretty smoothly as I got back in the groove of things. I practiced some left foot braking with varying results but I just gotta keep at it. It also seems really difficult to heel toe in the SVT, the pedal placement isn't great or maybe I just can't get my feet to cooperate. The morning session ended with me about 15 seconds ahead of the Daytona. Afternoon session was a new course layout and probably the fastest the DC region rallycross has ever done. Since the corners were getting badly rutted in the gravel the course designers made a longer course with a lot of slaloms and less tight turns. On the second run I was taking it a bit too quick and started to lose my back end, tried to correct... overcorrected and swapped the other way. Went back and forth then lost it completely and spun out doing a 180. I tried to get going again but took too long so I got red flagged giving me a DNF for the run. Pretty embarassing but the course workers said it was awesome to watch. The DNF penalty is the slowest time in your class for that run + 15 seconds. I learned my lesson from that incident and the rest of the runs went very well. Only problem I had was on a horseshoe where I could swing my rear end out enough and slide around the turn but then I'd hit the really loose gravel and just spin tires through first and second. I'm hoping an LSD will help a bit with my traction problems. For the whole day we had 14 runs total. My times weren't consistent... but that will come with practice. Near the end of the day, I had one random run with a time couple seconds faster than my rest. I was quite pleased since my time was right up there with the MR and MF guys but I couldn't get that time again. Also, first place and in the end I beat the second place Daytona by 70 seconds even with the DNF penalty! The SVT did extremely well on the faster course. So my plan for next race is to get the clutch and diff installed. I'm also thinking I need to make some suspension changes... The car can get a little bouncy in the ruts and I still bottom out quite a bit. I'm running the stock SVT suspension with spacers so I'm thinking maybe just putting in a stiffer spring for now? Maybe changing out the struts completely and getting KYB AGX for something cheap and good. I think the stiffer spring with same ride height might be a custom order, there aren't too many options for the Focus. Eventually I want to get coil overs but that will put me into Modified which I'd rather do next year. We still need more FWD competition so if you're in the DC area and own a FWD crap box bring it out! And everyone get out and support your SCCA!. Do a rallycross or at least an autocross. If you don't know where to go or what to do to get started just ask me.